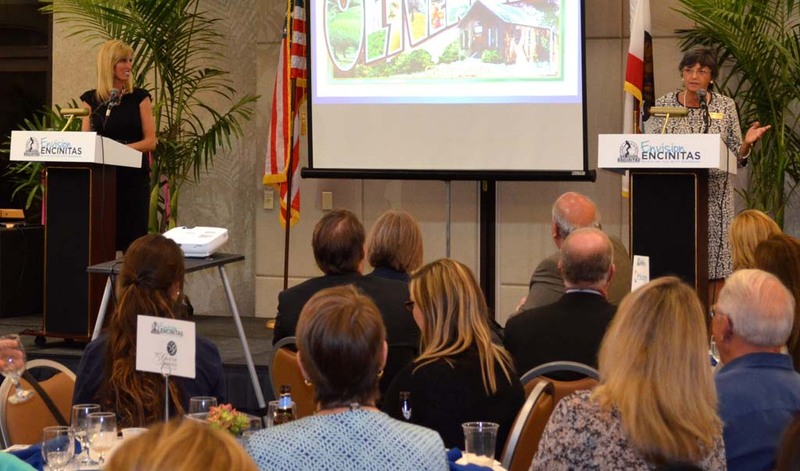 ENCINITAS — Teresa Barth and Kristin Gaspar, who are splitting this year’s mayor term, painted different pictures of the city’s direction during an occasionally tense State of the City address April 4. The contrast came down to the city’s recent $10 million purchase of the Pacific View property. Councilwoman Gaspar, who will serve as mayor during the second half of the year, delivered the first part of the joint address. She said the city paid too much to acquire the 2.8-acre site from EUSD (Encinitas Union School District). And consequently, she added, the city faces an unprecedented budget challenge. EUSD planned to auction Pacific View off last month, drawing protests from those who have long said an arts or cultural center should open there. 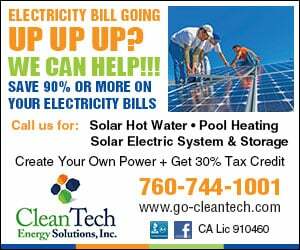 The council voted 3-2, with Gaspar and Councilman Mark Muir opposed, on March 20 to submit an eleventh-hour offer for the site. Not long after, the EUSD board of trustees voted unanimously to accept the deal. Paying for Pacific View will likely mean sacrificing core city services like road maintenance and sidewalk repair, Gaspar said. During strategic planning sessions over the last year, the city has prioritized which projects to spend money on, like a new lifeguard tower at Moonlight Beach, she said. Now, the city will have to wait to fund many of them. By the end of this fiscal year, the city forecasts $57.5 million in revenues and $58.7 million in expenditures in its general fund, according to the most current analysis. And the city anticipates $11.2 million in reserves. Those figures don’t reflect the Pacific View purchase. “This is an opportune time for your council to stay the course with strategic planning, take an in-depth look at Encinitas’ debt — its pending projects, its seemingly endless wish list — before committing our last resources for the foreseeable future,” Gaspar said. Barth spoke next, saying her recap of city affairs is the “hall-full, not half-empty” version. Barth said buying the property gives the city a chance to showcase local arts and culture. “While it is a significant financial commitment, economic studies consistently show that arts and culture venues can create positive economic impacts,” Barth said. She cited a 2012 study from the nonprofit Americans for the Arts, which found that arts organizations generated $665 million in economic activity in the county in 2010. The property is home to the old schoolhouse, which was built on the site in 1883. The dilapidated Pacific View Elementary, which closed a decade ago, also stands there. Barth went on to say the Encinitas Community Park, Encinitas Library and community center also demanded significant resources, but they’re what set Encinitas apart from other cities. While Gaspar largely focused on Pacific View and strategic planning during her presentation, Barth touched on a wider range of topics during her address. For instance, Barth touted the city’s success conserving water. Potable water demand in the San Dieguito Water District is roughly the same as it was in 1977, despite the agency serving a much larger population. And among similarly sized cities, Encinitas came in second in pledges to conserve water during the 2013 National Mayor’s Challenge for Water Conservation. As proof of the city’s healthy business community, Barth said a recent report shows sales tax revenue increased 7 percent, outpacing the county and state. Sales tax revenue during the fourth quarter of last year came to $3.13 million. And she mentioned the city’s growing urban agriculture movement, including Go Green Agriculture, a hydroponic farm on Ecke Ranch that’s soon to expand. The city has yet to outline how it will finance the Pacific View purchase. During a press conference announcing the purchase price two weeks ago, Councilman Tony Kranz noted residents sent 750 emails as part of the Save Pacific View campaign to council members and the school board. Community interest in the site could help ease the impact on the budget, Kranz said. He has suggested gathering donations for Pacific View via a crowdfunding website, like Citizinvestor, that specializes in civic projects. This past November, the council agreed Barth and Gaspar should share the mayor term, because both indicated they might run for the role this November. The mayor typically has an edge going into the election, so each having the title on the ballot would neutralize any advantage, council members said at that time. However, in her Apr. 5 newsletter, Barth said she won’t vie for mayor. Originally, Barth set out to stop at the end of her second term, but considered running for mayor because the role is only two years, as opposed to a four-year council seat. “While many people have encouraged me to run for Mayor, I stand by my original commitment to my family and the voters to only serve two terms,” Barth wrote. Gaspar is running for either mayor or the open council seat, but hasn’t announced which position yet. November will mark the first time Encinitas will directly elect a mayor. That’s because Proposition K passed in 2012, doing away with a council majority selecting the position. This article was updated on 4/7/14 to reflect the most current forecast for general fund revenues and expenses. The article was updated again on 4/9/14 to more accurately describe crowdfunding a civic project.